Every time I work through a pattern from an antique source I learn somethng new. This time, I learned that screaming at a dead woman does nobody any good. I suppose I already knew this to be so, but it didn’t stop me from bellowing forte fortissimo at the ghost of Cornelia Mee, prolific author of such nineteenth-century needlework best-sellers as Exercises in Knitting and Mee’s Companion to the Work-Table. It was in the latter that I encountered “For a Baby’s Hood, in German Wool.” Intriguing title, that. 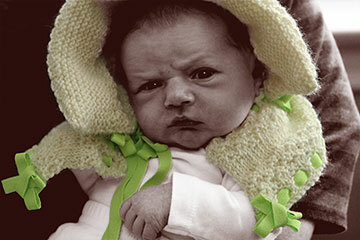 I’m familiar with hats and bonnets for babies–but hoods? Sounds exotic, even slightly sinister–two qualities I appreciate in a baby. I’ve been around the block with Mrs. Mee a few times and knew to expect speed bumps. But to my great surprise, the knitting proceeded with little ado. Wordy instructions for a “dice pattern” quickly revealed themselves to be what I was taught to call double moss stitch. Likewise, the slight shaping at the back of the headpiece sounded complex but turned out to be quite straightforward. Before long, I had three completed all three pieces of knitting. And I had no bloody idea how to fit them together. This is when the aforementioned screaming ensued. The pattern itself gives only the barest of clues: “The horseshoe is sewed to the headpiece.” It is, is it? Where, exactly? With which end of the horseshoe up? The frill “is sewed on” (to what?) “where the holes are made.” Which holes? There are two rows of holes on the frill, and two more on the headpiece. Answer came there none, not even when I attempted contact via Ouija board. I sewed, ripped and re-sewed the damned thing four times before finally arriving at what looks to me (with reference to a few contemporary illustrations and surviving objects) like a baby hood. I think, at last, that I got it right. And if I didn’t, Cornelia honey, you’re more than welcome to speak up. One of my favorite things about working from antique patterns is running across once-common construction techniques that have faded into obscurity. This hood has a padded ruche at the front opening–an eminently sensible feature I don’t think I’ve ever seen on a modern bonnet. It not only adds warmth, but protects the head from accidental knocks against the barn door, the butter churn, or other hazards of Victorian childhood. The hood produced by the pattern is on the small side–definitely best suited to a newborn. For an older or larger infant, work the pattern as written in worsted weight with appropriate needles. As always, change the fiber to suit your particular needs. The alpaca/wool blend is warm and soft, but not correct for the period. If you’re making this for a re-enactment, pure wool is the way to go. For warm-weather, switch to cotton, with cotton batting for the ruche. And as to finishing touches, Cornelia’s own suggestion is "a netted rosette, edged with silk floss." (She doesn’t tell you where to put it, of course.) As my netting skills are not what they ought to be, I substituted couple of very simple, hand-sewn bows. Use your imagination. The lack of specificity in antique sources can be frustrating at times–but it also makes them a springboard for creativity. 6 inches deep by 6 inches high. 9 inches high including frill. Yo at beginning of row. Before working the first stitch of the row, bring the working yarn over right needle from front to back. Rows 1 and 2: [K2, p2] across. Rows 3 and 4: [P2, k2] across. CO 70 sts. Work in garter st for two rows. Row 3 [RS]: [YO, p2tog] to end. Rows 7–32: Work in Dice Pattern . Rows 51-62: Work in Dice Pattern. Row 66 [RS]: [YO, p2tog] to end. Rows 70-81: Work in Dice Pattern. Note: Rows 82-88 will shape the back of the headpiece. Row 82 [RS]: K20, slip those 20 sts onto a holder or scrap yarn; [P2, k2] 7 times, k to end. Row 83 [WS]: K20, slip those 20 sts onto a holder or scrap yarn; [K2, p2] 7 times, k2. Note: Rows 84-86 are worked only on the center 30 sts. Rows 84–85: Work two more rows dice pattern. Rows 86 [RS] : Knit. Turn work. Row 87 [WS]: Knit the center 30 sts. Do not turn work. Slip adjacent 20 sts from the holder or scrap yarn on your left to free needle and knit them. You will have 50 sts on your needle. Turn work. Row 88 [RS]: Knit across to rem sts on scrap yarn. Slip these 20 sts from the adjacent scrap yarn or holder to free needle and knit them. Row 89 [WS]: Knit all sts. Rows 1–16: Work in Dice Pattern. Row 17 [RS]: K1, m1, k1, work in Dice Pattern as established. Row 18 [WS]: P1, m1, k1, continue Dice Pattern to last stitch, k1. Row 19 [RS]: K1, m1, continue Dice Pattern to last stitch, p1. Row 20 [WS]: K1, m1, continue Dice Pattern. Row 21 [RS]: K1, m1, p1, continue Dice Pattern. Row 22 [WS]: K1, m1, p1, continue Dice Pattern to last stitch, p1. Row 27 [RS]: K2tog, k1, work in Dice Pattern (beginning with p2) to last stitch, k1. Row 28 [WS]: k2tog, k1, continue Dice Pattern to end. Row 29 [RS]: P2tog, continue Dice Pattern to end. Row 30 [WS]: P2tog, continue Dice Pattern to last stitch, k1. Row 31 [RS]: P2tog, p1, continue Dice Pattern to last stitch, p1. Row 32 [WS]: P2 tog, p1, continue Dice Pattern to end. Row 33 [RS]: K2tog, continue Dice Pattern to end. Row 34 [WS]: K2tog, continue Dice Pattern to last stitch, p1. Row 35 [RS]: K2tog, k1, continue Dice Pattern to last stitch, k1. Row 36 [WS]: K2tog, k1, continue Dice Pattern to end. Row 5 [RS]: [Yo, p2tog] to end. Rows 6–15: Work in Dice Pattern. Repeat Rows 16 and 17 twice more. Rows 22–29: Work in Dice Pattern. Row 32: [Yo, p2tog] to end. Wash and gently block all pieces before sewing up. 1. Fold cast-on (unshaped) edge of headpiece back along first row of garter stitch so that first and second eyelet rows align. Pin long edge in place. Using mattress stitch, seam the two short selvedges of folded portion to form a shallow pocket. Unpin long (eyelet) edge and stuff gently with fiber. Using a running stitch, sew long edge closed, taking care to keep both rows of eyelets aligned. 2. Lay headpiece and horseshoe on a work surface with right sides facing up and top center of horseshoe aligned to center of cast-off (shaped) edge of headpiece. Pin the pieces together at this point. 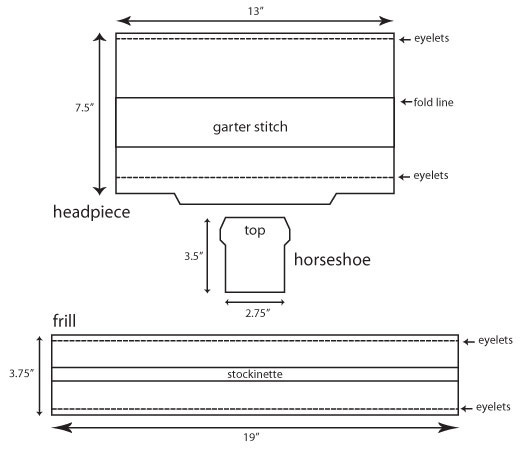 Using mattress stitch, seam horseshoe to headpiece, working first from center to the left and then from center to the right. 3. With right sides facing up, pin top center portion of frill (with ten rows of dice pattern) to lower edge of horseshoe. Using mattress stitch, seam pieces together. 5. If you wish, trim hood with bows, rosettes, or other ornaments of your own devising. (Cornelia Mee recommends “a netted rosette, edged with silk floss.”) My version includes extremely simple bows sewn from extra ribbon at the bottom corners of the headpiece and the frill. Franklin Habit is a knitter, writer, illustrator and photographer who lives in Chicago. His first book, It Itches: A Stash of Knitting Cartoons , was recently published by Interweave Press. Visit his blog at the-panopticon.blogspot.com.